Nicolas Beytout, age 59, journalist, is the founder of a new daily, a Web–print–Video–Apps media called L’Opinion. In 1981, he joins Les Echos, the main business daily newspaper in France. From 1984 to 2004, he is Editor of the daily, then Editor of all the publications of Les Echos Group. 2004-2007 he joins Le Figaro as Editor and Director for all the publications of the group, member of the board. 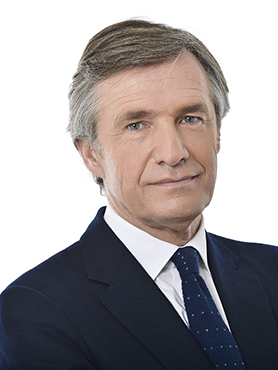 October 2007, he is back to Groupe Les Echos as Chairman and CEO of this media group : Les Echos, Investir, Radio Classique. 14 May 2013 he launches l’Opinion. He has been active on other medias since 1994. Radio : RTL, Europe 1, France Info, France Inter as a Columnist. Televison : TF1, LCI, then iTélé , BMF TV, France 2 (Mots Croisés), France 5 (C dans l’Air) . Nicolas Beytout was a member of the National Committee on the Euro (1997-2002). He has been a member of different boards : Musée d’Orsay, Fondation de France , Agence France Presse and OJD (the official certification board for newspapers). He graduated with a degree in law and a BA degree from Sciences Po. He is Professor at Sciences Po. He is Chevalier de la Légion d’Honneur. He won different awards for his professional contribution. Faut-il renoncer à la mondialisation? Should We Give Up On Globalisation?